One of the educational projects from the European Wilderness Society is Let’s get Wild! This month we had another highlight in the project: the educational TV series ‘Newton’ from ORF joined our school project. In the project, youngsters from many different schools learn about nature and animals in Europe, and why they are so important. 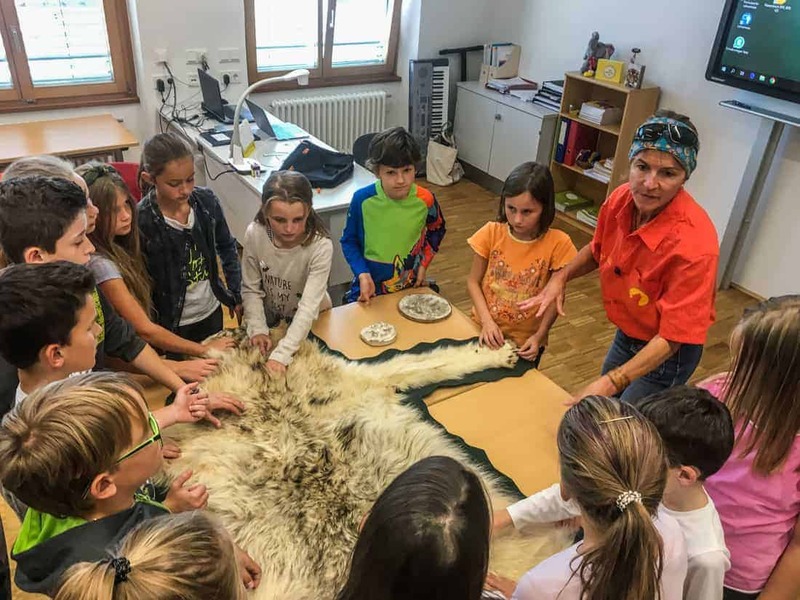 The ORF television crew joined the European Wilderness Society at the primary school in Radstadt. Together with the youngsters of the 4th grade, our colleague Gudrun Pflueger discussed the topics. One of the topics is wildlife, especially large carnivores, such as the bear and the wolf. After the introduction, the group and tv crew did an outdoor workshop on wildlife coexistence. In this workshop the participants are able to get familiar with the wooden life-sized animals, and how to react when you encounter them. As Gudrun herself has unique first hand experiences encountering wild wolves, she could tell vividly how things went. As the kids learned about the role of Wilderness and the way that animals behave, it became clear that people do not have to be afraid of wildlife. A solution to many of the conflicts that society currently has, is a sustainable way of coexistence. A special hands-on experience with livestock protection techniques showed the kids that fences can protect sheep and goats for example. Looking from the perspective of the wolf, the kids learned how to use their ‘wolf senses’ to understand more of the wolves’ behaviour. This is a very important aspect, in comparison to how people expect wolves to behave. The class teacher prepared the kids really well! So it was great to have such interested kids and build on their theoretical knowledge with our practical experience. European Wilderness Society believes that this is one of the special strengths of the project. Therefore, we join the kids in the classrooms and help them and the teacher to get ready, for the wild world outside. The Newton episode will be aired later this year on television, so stay tuned for more information.